Alec Torelli is near the top of the leaderboard. The World Series of Poker Circuit Main Event at the Bicycle Casino has exceeded all expectations after two starting flights combined for over 13 hours of action. A total of 537 entrants put up the $1,600 entrance fee, 303 for Day 1a and 234 for Day 1b, and after all the chips were bagged and tagged Brandon Crawford sits atop the tournament leaderboard with 115,000. Crawford will be joined on Day 2 with notables Alec Torelli (95,000), Bryan Devonshire (91,000), Kenna James (40,000), Steve Brecher (37,000), Thor Hansen (31,000), David “ODB” Baker (28,000), “Miami” John Cernuto (21,000) and Nick Rampone (17,000). It wasn’t all good news for notable players, many of them found the rail; including Jerry Yang, Allen Cunningham, Jeff Madsen, Tuan Le, Owais Ahmed, Kelly Kim, Breeze Zuckerman and Amanda Baker. Devonshire finished strong after a super short morning flight. He busted on the first hand to a higher straight. Devonshire held and the board showed when all the money went in. His opponent held and Devonshire had the afternoon to prepare for his late night run. Cunningham was eliminated on a board reading . He bet 3,000, about a third of his stack, on the river and was insta-raised to 15,000. He called and his opponent showed him for a straight. Cunningham announced on Twitter that slow played a set and allowed his opponent to catch up. Phil Hellmuth was on the minds of tournament officials and players alike. He posted on Twitter that he was going to play the event but never showed up. He has until the start of Day 2 to register and if he does he’ll have a 20 big blind stack work with. All the surviving players will return Wednesday at noon PST for Day 2 and follow all the action live on Pokernews.com. The clock has been paused and the field will play three more hands before bagging and tagging for the night. We mentioned about an hour ago that Bryan Devonshire had suddenly increased his stack (according to him he 5-bet bluffed and got there...standard), and we just caught a pot that has upped his stack to nearly six figures. Devonshire raised to 1,700 preflop, and got just one call out of the big blind. The two players saw a flop of , and the big blind checked to Devo, who fired out 2,000. He was check raised to 4,500, but didn't take long to make the call. The turn brought the , and the big blind wasted little time in firing out 6,000. 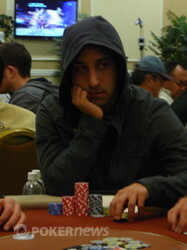 Devo thought for about 20 second before throwing out a pile of blue T5,000 chips that would put his opponent all in. She tanked for about 2 minutes before letting her hand go. After dragging the pot, Devo is now sitting on around 90,000. Bryan "Devo" Devonshire had been hovering around his starting stack for what seemed like the entire night until our last walk through the floor, where we noticed that his stack had more then doubled to over 50,000. We aren't sure how he got those chips, but its safe to say that with nearly 100 big blinds, Devo could be a big factor if he can make Day 2. We found Ladell Alen, Phi Nguyen and an unknown player all put in more than 3,000 preflop. The flop came . Alen was in the big blind and checked, the unknown player checked and Nguyen bet 5,500 on the button. Alen called and the unknown player got out of the way. The turn came and Alen moved all in. Nguyen called and the hands were tabled. Nguyen had the lead in the hand and had to dodge a queen on the river. Know what's coming next? Yup, the came on the river, shipping the sizable pot to Alen. Jeff Madsen has been up and down all night, and for the past hour or so, it's mostly been down. Madsen had been riding a short stack of about 6,000, and he was just eliminated in brutal runner runner fashion. Facing a raise of 1,600 preflop, Madsen shoved all in for 3,425 on top. His opponent reluctantly called, and Madsen saw he was far ahead. The flop was safe enough for Madsen, coming . The on the turn brought a gutshot straight draw, and that straight was completed with the on the river. Madsen quickly made his way to the exit, ending his run at this circuit event. We hardly noticed Kenna James in the corner of the poker room until an hour ago, as he was not sporting his signature Cowboy Hat (He's wearing an Epic Poker hat instead). However, we have taken notice of James now, as he has just won a big pot to boost his stack over 50,000. When we came to James' table, he was facing a big decision, as his opponent had pushed all in for 12,225 on a flop of . We aren't sure how long James was thinking, but as soon as we came to the table, the clock was called on him. There was about 8,500 in the pot, and as he was thinking, James sat still in his chair, simply shuffling chips. The floor began to countdown from ten, and when she said eight, James flung in the call. James made the right call with his overpair, and he was rewarded with the on the turn, sealing up the hand with his set. The river came the , giving James a full house and his opponent useless trips. With that pot, James is up to 53,000.